With little more than a sheet of paper and some dexterity, crafters can make 75 origami projects designed for everyday use. 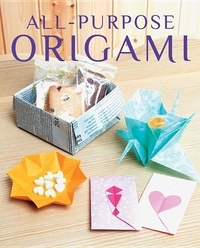 Generally speaking origami, Japanese paper-folding, is a casual hobby for all-ages. While some projects have practical applications most tend to be for aesthetic or entertainment purposes. All-Purpose Origami's patterns on the other hand are much more meaningful. The 75 projects compiled were crafted for the sole purpose of at home use. Whether to be applied in the dining room for special occasions or for Eco-friendly items around the office, these easy to follow pattens are designed to last and to look stylish for days and weeks. Perfect for use at home the cups, boxes, envelopes and table placement patterns in All-Purpose Origami are as resourceful as they are fun to make!